Well, have you? You have! Great job! I promise you, that’s not it. And that’s where the follow-up emails come in. Here are my time-tested top nuggets of wisdom about working the follow-ups. Always BCC – Just a quick word about sending out mass emails: always use the BCC (Blind Carbon Copy) function in your email program (or better yet, send your messages through the email function in your 3-Day Participant Center; you can BCC from there, too). This allows you to send a message to a large group of recipients without openly listing everyone’s email addresses in the To field. It’s important to be respectful of your potential donors’ privacy. That said, some email programs won’t let you see who was included in the BCC field once a message has been sent, so we recommend that you keep a separate list somewhere of everyone you sent your messages to. Time It Right – I think that, in general, 2-3 weeks is a good amount of time to let pass after sending your first fundraising email before you send out a follow-up. After that amount of time, it’s likely that your original message has been inadvertently forgotten or lost in someone’s inbox. So you give folks that gentle nudge, then subsequent follow-ups can be spaced out with the same amount of time, or up to a month apart. 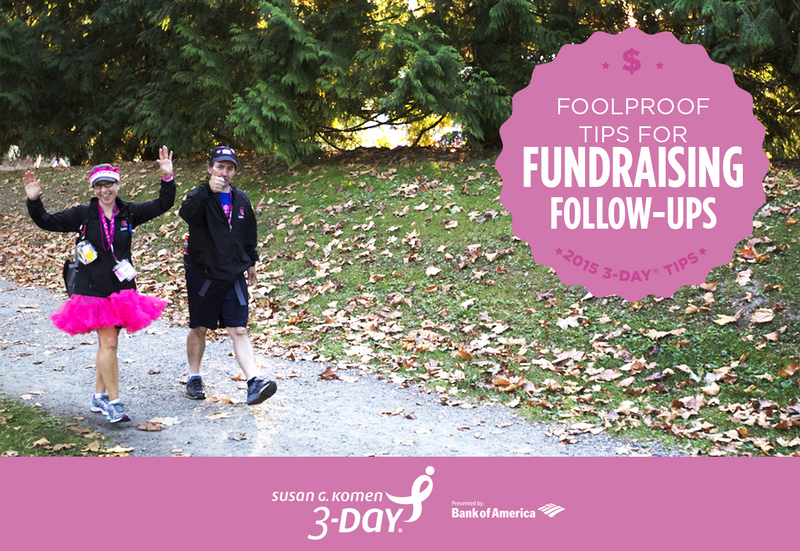 Opportunities for Updates – The main purpose of the follow-up email is to remind your donors about your fundraising efforts, but follow-up emails are also a terrific way for you to update your friends and family about your preparations for the 3-Day. Let them know how much time is left until your event (I’m sure you’re counting down the weeks and days anyway, but if not, you can see exactly how much time is left on the home page of your Participant Center), share stories about how your training is going (“I totally conquered my first 10-miler this past weekend!”), and of course, let everyone know your fundraising progress (“I’m just $100 away from reaching my halfway point!”). Then, ya know, remind them that it’s not too late to donate. Procrastinators Beware – Also urge them that it’s never too early to donate! A lot of donors will put off donating, thinking, “Oh, she has 4 months to raise her money, she doesn’t need my donation right now.” Use one of your follow-up messages to remind folks that when they give to Susan G. Komen® through your 3-Day fundraising efforts, their donations don’t sit in a bank account until your event, they go to work right away. You can also point out that by helping you reach your fundraising goal early, it frees YOU up to focus on training, travel preparations and other groundwork for your upcoming 3-Day event. Name a specific deadline that you’re aiming for; at this time of year, Mother’s Day, Memorial Day or the first day of summer are great landmark dates to push for. Get Personal – When you send out your initial fundraising email, it’s a great idea to cast the net wide, so to speak. In other words, send it to everyone you have an email address for (and I do mean everyone!). However, you should also make a list of your dozen or so closest friends and family members, and follow up with them personally. This can be done over email, though a phone call or a face-to-face check-in may be better. Tell them that their support would mean so much to you. A mass email is great for maximizing your reach, but your closest circle of supporters will appreciate that personal touch, making them more likely to donate. As always, if you have questions about the most effective ways to make follow-up fundraising work for you, pick up the phone and call your helpful and always friendly 3-Day coaches at 800-996-3DAY. What are your go-to tips for follow-up success?